Visitor Queue is an advanced B2B lead generation software that identifies the name, contact details and user data of the businesses that visit your website. One of the most popular features amongst our early adopters was email notifications of the leads in their account. To deliver notifications more effectively and efficiently we decided to offer Slack notifications as well. Slack is quickly becoming an app that is at the heart of successful organizations across the globe. 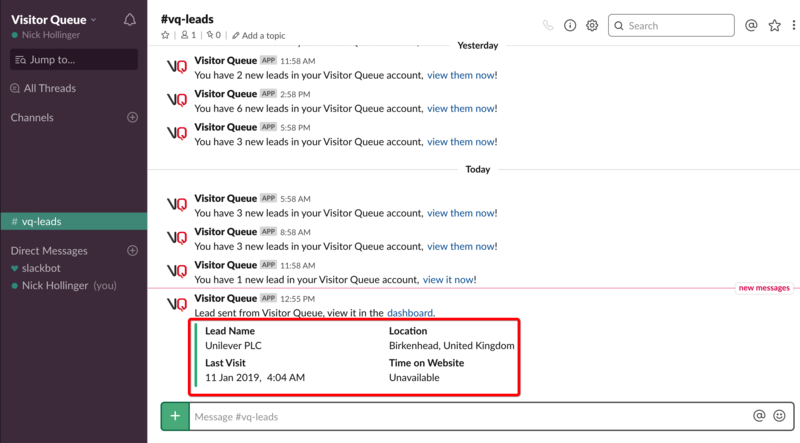 Use our Slack integration to receive new Visitor Queue leads directly in your Slack channels! 1. If you already have a Visitor Queue account, sign in here. If you are new to Visitor Queue, you can sign up in minutes to get started. 2. Once you sign in or sign up, you'll be able to see your Visitor Queue dashboard. In the top right corner, click your account name to access a drop-down menu. Click the "Settings" option from that drop-down menu. 3. When on the settings page, you'll be able to see tabs for different settings - select the "Integrations" tab. 4. When in the "Integrations" tab, you will now see a card with the Slack logo and button underneath that reads "Connect" - select that button. 5. You will now be taken to the Visitor Queue app in Slack to give authorization. On this page, you will have to pick the channel or direct message that you want Visitor Queue leads sent to. 6. Once you have selected your channel or direct message, click the button at the bottom to authorize. 7. You're done! 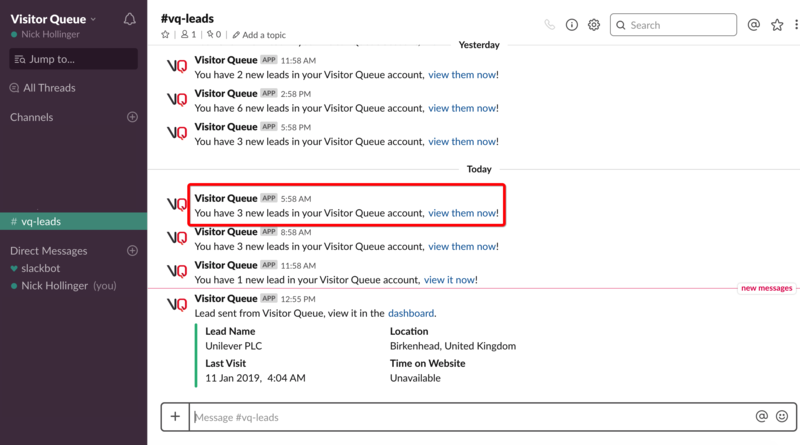 Now when you visit a lead record, under the integrations tab, you'll be able to manually send individual leads from Visitor Queue to Slack. Additionally, you will receive regular notifications of the number of new leads in your account. Identify the decision makers at the companies that have visited your website! Discover their name, position, department, phone number, Twitter account, LinkedIn profile and email to get into contact with them! Did you know that on average 98% of website visitors leave your website without getting into contact with you? Identify the name, location, contact information and so much more of those businesses. Never waste your time searching through multiple queues. Our powerful Company Search feature allows you to find any lead within your Visitor Queue account in no time. Let’s face it, there are likely some companies that visit your website that you wouldn’t consider a lead. You can easily prevent these companies from showing up in your account by hiding them. You don’t have to just work with your leads within Visitor Queue, you can export your leads and work with them elsewhere. We promise we won’t be upset if you regularly export your leads and develop them into sales outside of Visitor Queue! Unlike regularly scheduled email notifications, if you find an interesting lead (or multiple ones), you can easily email it/them directly to someone’s inbox. Whether they are a user within Visitor Queue or not - share leads with anyone! We don’t require any special website codes, which means you won’t need any support from your IT team! All you need is access to your Google Analytics account and to follow our easy 3-step setup process and you will be working with your leads in minutes! If you ever have any questions, comments or concerns about your Visitor Queue account, our dedicated support staff are here to help! We understand that utilizing a new software in an organization is difficult, so don’t be afraid to contact us! There’s a possibility that not all the leads in your account are applicable to your business. Use Account Filters to only see leads from from a certain city, country or ones that visited certain pages on your website.